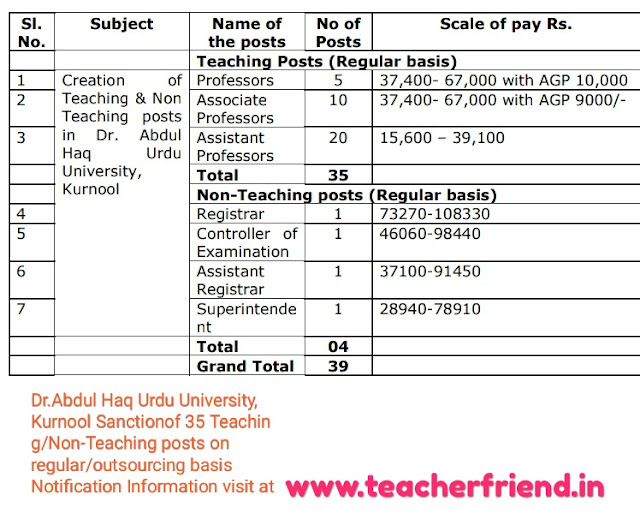 Dr.Abdul Haq Urdu University, Kurnool Sanctionof 35 Teaching/Non-Teaching posts on regular/outsourcing basis Recruitment Notification Online Application as per G.O.MS.No. 114 Dated: 24-07-2018/AP Dr.Abdul Haq Urdu University, Kurnool Sanctionof 35 Teaching posts (as per model (1+2+4)) & (04) Non-Teaching posts on regular basis/ outsourcing basis as per G.o.No:114. Orders as per G.O.MS.No. 114 Dated: 24-07-2018. Higher Education e-file No.6430/UE /A2/ 2017, dt.07.05.2018. established Dr.Abdul Haq Urdu University, Kurnool. sent the proposals to create certain teaching and non-teaching posts in the newly established Dr. Abdul Haq Urdu University, Kurnool. After careful examination of the proposal of the Higher Education Department, Government hereby accords sanction for creation of the following (35) Thirty Five Teaching posts(as per model (1+2+4)) & (04) Non-Teaching posts for the current academic year in Dr. Abdul Haq Urdu University, Kurnool.